Located in a picturesque part of Northern Thailand south of Chiang Mai city, this project was formed in cooperation with a Karen family who has cared for and worked with elephants for over 25 years. 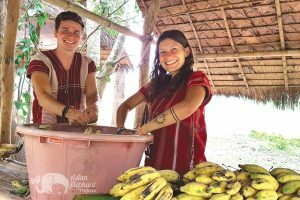 After changing into traditional Karen clothing, guests cut pumpkin and sugar cane and get to know the elephants a little while feeding them. 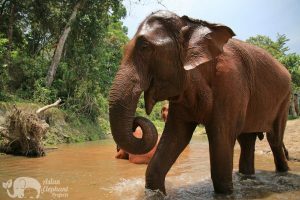 The group will then cross a stream and venture into the jungle on foot with the two gentle natured elephants for a 2 hour trek, stopping to watch them forage along the way. 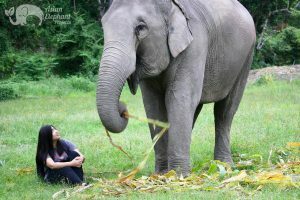 After a vegetarian buffet lunch, visitors will be shown how to make healthy treats for the elephants made from rice, pumpkin, banana, tamarind, and salt. 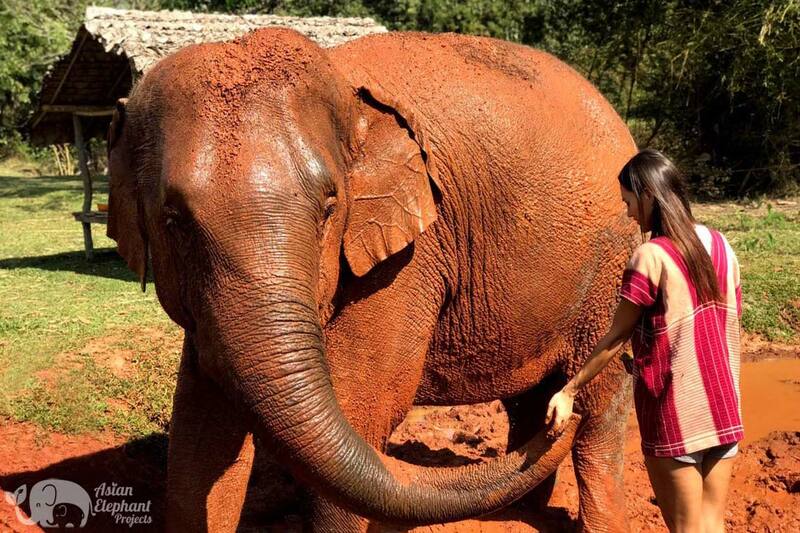 Later, guests can bathe the elephants in a nearby stream, followed by a mud bath, which nourishes and protects their skin. As a parting goodbye, feed the elephants the healthy snacks prepared earlier. 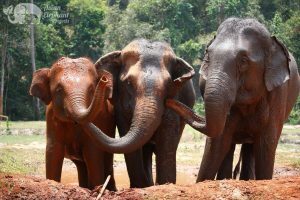 In the past, the family had to lease their elephants to tourist camps where activities included elephant riding and performing in shows. When they heard about the ‘Saddle Off’ model based on compassion, with elephant-friendly activities, they were eager to join so that a better life could be provided for their elephants. 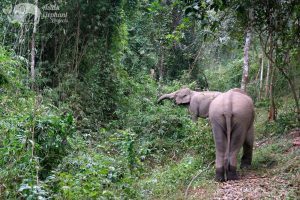 Thanks to this project, the elephants have been able to return to natural surroundings at the edge of the jungle where they are much healthier and happier. The resident elephants are now more relaxed, no longer give rides or perform, and are free to socialize, graze in the fields and forage in the jungle. The family grows grass for the elephants and buys food from neighboring farmers. Local Karen weavers are invited to makes baskets and traditional textiles woven on hand looms, which also helps to support the local community. 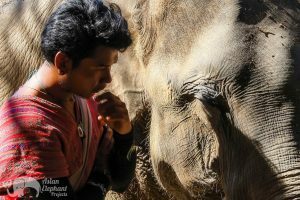 By visiting this project you are making it possible for elephants to live a more natural life and helping preserve Karen culture. Start: 8:00am – 8:30am pick up from your Chiang Mai city hotel, or from our office at 7:45am. If staying out of town (outside the middle ring-road) additional charges may apply. Please advise on your reservation form. Travel Details: Transfer from air-con minivan to 4WD pickup for the last 5 minutes of the journey in the rainy season. Age Suitability: Adults and children over 7 – guests under 18 must be accompanied by an adult. Families with children aged 2-7 may also visit this project. 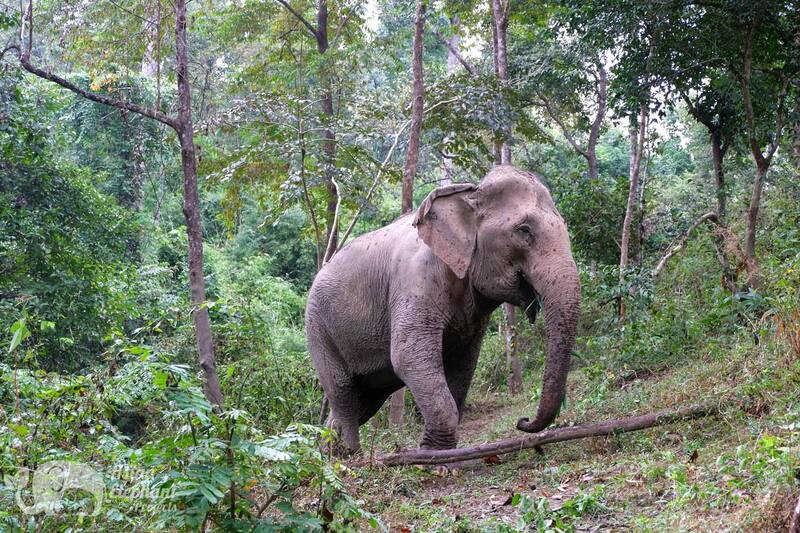 Fitness Level: Moderate – cross a shallow stream via a bamboo bridge and enter the forest, following trails with some steep sections for about 2 hours, stopping to watch the elephants forage. Topography: Grassland, jungle, hills & stream. Extra Activities: Watch local Karen women weave traditional handmade textiles and learn about Karen culture. 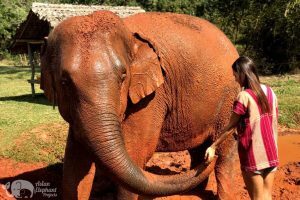 This project is owned by Boon Paeng and run with the help of his Karen family who have a long history working with and caring for elephants. The elephants used to be leased to elephants camps which took a toll on their physical and mental health. While it saddened the family, they didn’t see any other alternatives at the time, being unable to meet to the substantial costs of caring for elephants.The family was happy to join our ‘Saddle Off’ initiative so that their elephants could return home, where they are surrounded by nature, and are free to roam, socialize, and forage. 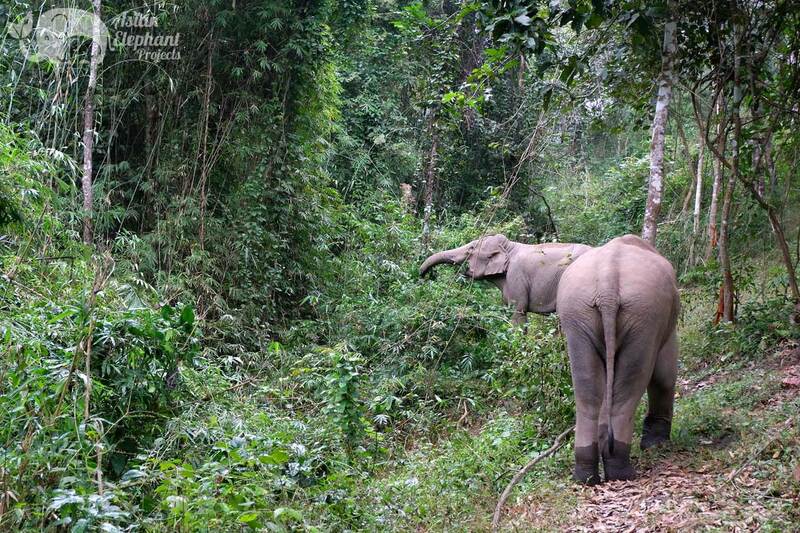 There are currently two elephants living at the project - a male and a female. 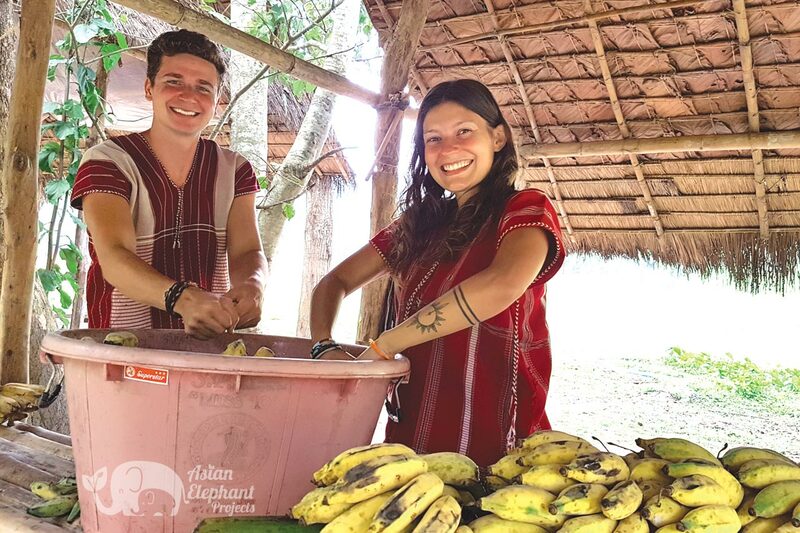 This project supports the local community by allowing Karen weavers to sell their handmade textiles to visitors and buying food for the elephants and guests from local farmers. They also plant crops on their land to help sustain the elephant’s insatiable appetites. 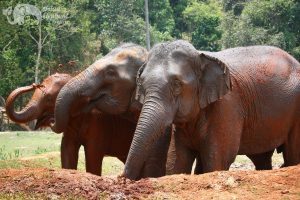 The family have been encouraged to see the elephants enjoying a more natural life and how much guests to their project appreciate being with elephants in a way that is considerate of their well-being.